To me, these Oven Baked Blueberry Bars just scream childhood. I can remember finding one of these in my lunch bag back in elementary school. Granted, the version I had were flattened and smooshed thanks to my lack of care, but they had looked like bars at some point. 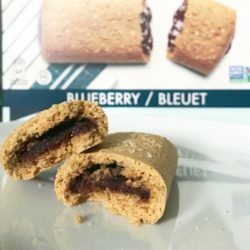 Glutino makes these gluten free oven baked bars. While I only had the pleasure to try out the Blueberry flavour, there are also Apple Cinnamon and Strawberry choices, too!